Say goodbye to spraying synthetic, chemical-laced odor eliminators in your house. 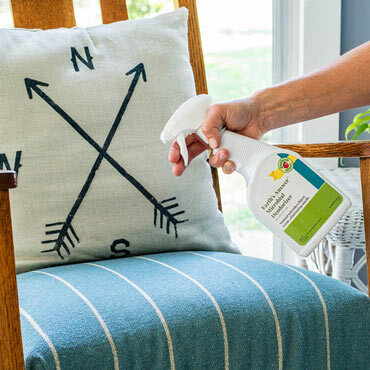 Earth's Answer™ Microbial Deodorizer spray biologically cleans and deodorizes by digesting the organic wastes that cause the strongest, most unpleasant odors. Its biologically active formula includes beneficial bacteria, natural surfactants, and a pleasant citrus fragrance to provide one-step cleaning and deodorizing. It immediately neutralizes strong odors such as those from hydrogen sulfide, ammonia, fatty acids, pets, human waste and molds. The spray is completely safe to use on floors, carpets, furniture and counters, and is great for bathrooms, kitchens, cars, pet areas and more. It's an eco-friendly way to keep your home smelling fresh and clean without resorting to unfamiliar chemicals. Each large spray bottle holds 32 oz of deodorizer.